Plants grow to about 30 cm, and flower between July and October. They are biennial, taking two years for seeds to grow to mature plants which then die after flowering. The plants have a basal rosette of sometimes purplish spathulate (spoon-shaped) leaves from which branching flowering stems grow. The basal leaves have often died when the plant is flowering. The flowering stems have 5 to 10 pairs of small pointed leaves, 1-2cm long. Several purple flowers are borne at once on the top of each plant. The flowers have a tubular corolla (joined petals), which ends in five pointed and spreading tips. Inside the corolla there is a fringe of white hairs, at the junction between the tube and the star-like lobes. The corolla is surrounded by a short calyx (the sepals) which also has 5 pointed lobes. · Field Gentian is generally shorter than Autumn Gentian. · The flower parts (calyx and corolla) are usually 4 lobed in Field Gentian, unlike Autumn Gentian which generally has five lobed floral parts. · Field Gentian is more likely to be found in neutral or acidic grassland, whereas Autumn Gentian prefers calcareous soils. · The calyx lobes (i.e. the sepals) are unequal in size in Field Gentian (with two being very broad and overlapping the other two), whereas the calyx lobes are more or less all of equal size in the Autumn Gentian. Autumn Gentian grows in dry or gravelly grassland habitats on basic soils. Autumn Gentian habitats are under threat of being lost due to land abandonment, changes of use, and agricultural improvement. 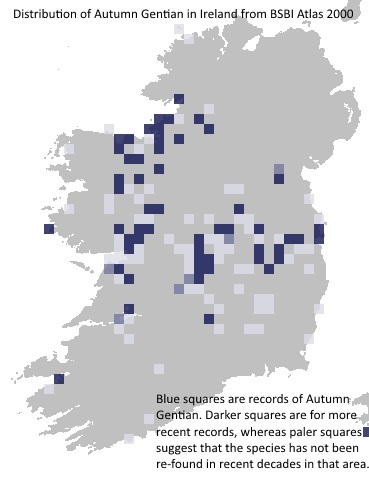 If you have seen Autumn Gentian or any of the species in the Irish Species Project, please download the guidance document for detailed instructions and the recording form where you can tell us about the plants you’ve seen (also available at http://www.bsbi.org.uk/ireland.html).